They agreed further steps on the Malaysian Airlines crash investigation. 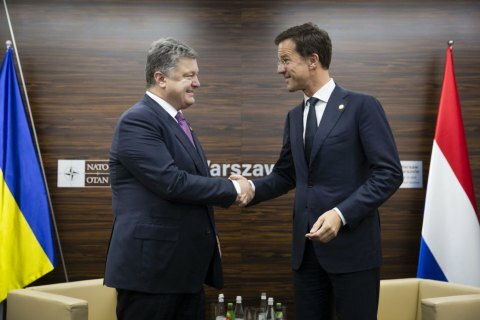 President Petro Poroshenko has met Dutch Prime Minister Mark Rutte in the framework of the NATO summit on 9 July. According to Poroshenko's website, he urged the Dutch party to approve "responsible" decision on the Association Agreement between Ukraine and the EU. The president believes that the Dutch prime minister will also facilitate the acceleration of the adoption of the decision on the introduction of the visa-free regime for Ukrainians. He thanked Mark Rutte for his position that allowed the EU to continue the effect of sectoral and economic sanctions against Russia that have already proved their efficiency in making Russia to stop its aggression. The parties have also coordinated further steps in the context of the investigation of the MH17 tragedy.